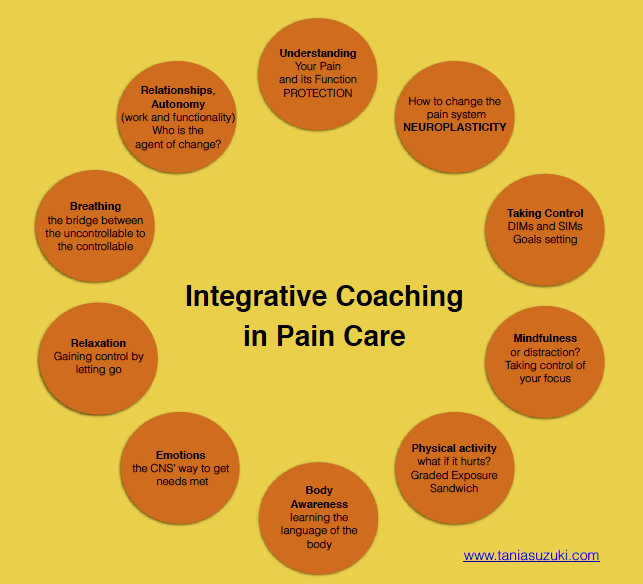 Provided by Tania Casthilo, Registered Clinical Counsellor who specializes in pain care and also holds a Masters in Kinesiology. Join Tania for a 10 week series of group sessions. Together you will explore concepts relevant to your pain experience, different techniques inspired by yoga, eutony and other somatic practices while sharing with and learning from the group. 10 week commitment is mandatory. Weekly payments available with credit card on file. I am very excited to invite you to embark on this new journey with me! It will be a wonderful opportunity to view or review concepts relevant to your pain experience, how you feel in your body, practice different techniques together and share and learn from the common experiences in the group. My plan for the group is to meet for 10, 90 minute sessions, on Tuesdays from 5:15 to 6:45, starting April 30th. For each session I want to dedicate time to go over the topics on the image below and practice regulation techniques together. These techniques are inspired by yoga, eutony and other somatic practices. The cost suggested by BCACC for group work is $55 an hour. Therefore, sessions would be $82.50 for new clients, and $60 for those I’m already seeing. Registration is open for you, my current clients, first. It will open to everyone onApril 20th. If you are interested, please register as soon as possible to secure your spot, by contacting the clinic. Over my 25 years practicing I have worked with many groups. It is amazing to see what happens when clients learn from each other and share in their common experiences! Chronic pain impacts 1 in 5 Canadians. In the past 30 years there has been an enormous shift in the understanding of pain which has been radically changing how to treat it. It transitioned from a medical issue to a biopsychosocial phenomena. It is now well established that pain and tissue damage are different entities and best practices in pain management nowadays are not reduced to fixing issues in the tissues, but rather address how the brain and nervous system interpret threat and safety, preserving/enhancing the sense of agency of those who experience pain. This shift has started with the neuromatrix theory, published by Ronald Melzack in 1989. This theory gave rise to a real revolution in the understanding of pain in the past 30 years, and nowadays it has been led by the Researchers from the NOI group (Neuro Orthopedic Institute). We now know that the more people understand the science of pain and the role of the brain and nervous system in pain, the more they can understand that pain is about protection, not damage, which in turn, leads them to have less pain. Contact us to learn about the modern pain science and find out how to use it to change your pain experience and cultivate your sense of safety in your body, by re-patterning your nervous system. Bring a friend or family member and get one at 50% Off! Feeling the pressure of the approaching exam season? Students of all levels are invited to join us! Students can expect to improve their cognitive control, emotional regulation and self-awareness. This will bring about more efficiency, creativity and quality when doing things like writing papers, performing on stage, or preparing for an exam. Bonus: you may find more motivation and enjoyment as well! Physical: more energy, better sleep, relieve pain, slow aging/longevity ….. Mental: Tame monkey mind, less complaining, positive mindset, more concentration…. Emotional: control and cure anger/anxiety/depression/insecurity, more stability, happiness, love/beloved sensation…. How？ By remaining calm, sustaining attention, filtering distraction, focusing more consistently and appropriately in face of academic demands and stressors. ​Let us know if you'd like us to bring them back! 60 minute self-care workshop exploring the different ways acupressure can help with pain, headaches, digestive disorders, insomnia, menstruation, common colds and so much more! Only $30 per participant. This workshop teaches you how and where to apply acupressure therapy. It also includes some Taoist health preservation practice. Depending on the feedback of participants the workshop could turn into regular classes. Appropriate acupressure everyday can evoke the body’s natural healing response through various physiological systems such as nervous system, endocrine and immune systems, cardiovascular system, and digestive system. By stimulating the body’s various systems, acupressure can help to reduce pain and improve sleep, digestive function, and sense of well-being. "During my 26 years of experience of self-care message on ears, head, feet, belly… I have learned that a healthy body could be maintained, a mild sickness could be treated, a severe condition could be abated if we apply self-care acupressure appropriately every day." Call to be added to our wait list for additional classes. We can add additional workshops based on a minimum of 4 registrants. Improve your core strength and posture with poses that challenge your ability to stabilize your your spine, pelvis and shoulders. This class is progressive and educational, starting with easier poses and gradually building in difficulty and intensity. Techniques and poses that promote stimulation of the parasympathetic nervous system (rest/digest/relax) and downgrade the sympathetic nervous system (fight/flight). Stress and anxiety are linked to a wide variety of health problems including headaches, back and neck tension, digestive problems and insomnia to list a few. Implementing some strategies to relieve some stress can greatly affect your overall health and wellness. This class is progressive and runs for 8 weeks. In this series you will learn the basic pilates principles and learn how to properly engage your core muscles to stabilize the pelvis and spine. Back pain can be caused by many things but is often linked to faulty firing patterns and poor recruitment of the deep stabilizing muscles of the pelvis, spine, shoulder blades and neck. This series is appropriate for people suffering with back pain (lower back, mid back, neck pain), it is not appropriate for acute disk herniation, spasm, sciatica. This is a 2 hour workshop for new Mothers recovering from pregnancy, labor, delivery and back/neck strain from breastfeeding and baby care. You can bring your baby to this class provided he/she is not walking or crawling. If you experienced significant trauma in delivery it is recommended that you have a private Free 15 minute consultation with Kasey Thompson, RMT before attending. (Please book ahead of time). If you had a C-Section, you must be at least 6 weeks post surgery. This workshop focuses on safely rebuilding core strength, mobility and range of motion post pregnancy. Many moms are eager to return to their fitness routine but don't know where to start. You will leave with a clear understanding of which exercises are appropriate and which to avoid. Modification options will be incorporated so that no matter what your fitness level, you can make this routine work for you. This workshop is partly educational and partly participation and practice of the exercises so please wear something comfortable that you can move in. Each participant will get a booklet with a basic core strengthening routine that can easily be done at home with little to no equipment. (Some modifications may incorporate use of a theraband, mini stability ball or block). This workshop is appropriate for any stage of recovery postpartum (minimum 6 weeks). So even if it's been 2 years since you gave birth, and you still feel like you haven't regained good core control, you can still attend this workshop. Kinetics is a unique exercise / movement program developed by Steve Ferris, RMT. The Kinetics routines take your body through specific range of motion and movement patterns with intent to engage target muscle groups and restore proper motor firing patterns. Basic functional exercises such as squat and dead lift techniques are incorporated with therapeutic focus and cueing. Kinetics is an excellent way to get your whole body moving and feeling great. It is especially effective for people with sedentary professions/ desk jobs or for prepartion for sports, fitness or vigorous workouts. It is a wonderful enhancement to every-body's health and wellness. Kinetics is an easy to learn, adaptable, safe and effective method of exercise. Foam roller programs allow you to stretch muscles and tendons while also breaking down scar tissue and soft tissue adhesions that can contribute to tightness, soreness, reduced flexibility and pain. Foam rolling is used as a comprehensive tool with both athletes and patients in the clinic as a way to provide home care techniques to maintain and promote recovery. ​In this innovative foam rolling workshop, you will be guided through a series of foam rolling techniques that focus on different areas. Intensity levels will vary. You will have an opportunity to try a variety of foam rollers as well as tennis balls, lacrosse balls, and other self-massage tools. You will learn techniques to help you get into those tough to reach areas and target specific trigger points, in order to decrease pain and tightness. Justine Aichelberger, Athletic Therapist will work with you in a group setting, coupled with one on one interaction, to ensure that all exercises are performed correctly and effectively.